NFL Commissioner Roger Goodell tells Sports Illustrated's Peter King that yesterday's demonstrations "reflected the frustration, the disappointment, of the players over the divisive rhetoric [from Trump]. ... People love coming together around football. We saw nothing but exciting football." And President Trump told reporters as he boarded Air Force One in New Jersey last night: "[T]his has nothing to do with race. I've never said anything about race. This has nothing to do with race or anything else. 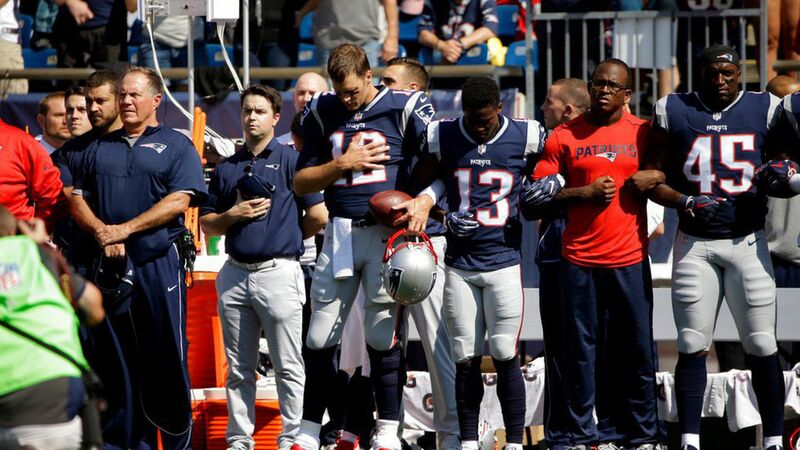 This has to do with respect for our country, and respect for our flag." Both protagonists were able to claim victory after the weekend's sudden drama. The massive unknown is whether President Trump will drop this topic for another, as he has so often, or make this a crusade. The NFL thinks this turned out to be a unifying moment for the league, but hopes Trump moves on. Players were angry but the reaction wound up controlled — there could have been much more chaos. For the NFL, this was a distraction from the core product: People tune in to watch games, not politics. Any time you have to say something's not about race, you have a problem. Republicans think the confrontation ultimately helps them with Middle America — their voters. But I hear from a rising swath that wishes Trump would focus on the country's real problems. We're at least as divided as ever. This weekend showed that no part of our lives is off-limits. Overheard 1: "My fantasy player kneeled. Now I have to drop him." Overheard 2: "Fantasy leagues should give a point for kneeling." Groundhog Day ... "Trump's War With NFL Threatens to Overshadow Rollout of Tax Plan."